There are thousands of replacement jets for spas and tubs and finding the one that fits your application can be particularly trying for many people. 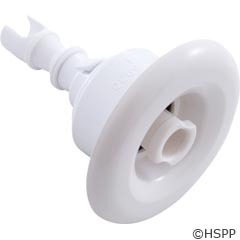 AllPartsPoolandSpa.com can help you find the replacement part you need, but in order to do that we need information from you. To help you find your part we need to have some pictures and some measurements. Most spa and tub manufacturers over the many years they are in business use many different jets. They in most cases do not make the jets that they use but buy them from companies that specialize in making jets. Your replacements come from these manufacturers and not the tub manufacturer. The same jet can be used by several different spa manufacturers. To give you the most help in your search you should send clear pictures and dimensions to [email protected]. The pictures should be at least one that shows the face of the jet completely and clearly. Another picture should show the side of the jet so that the diffuser is clearly shown. Additional pictures of the back side of the jet can often be helpful. You can use the pictures of jets on the website as examples of what the ones you send us should like. Take measurements of the jet as accurately as you can. The face diameter taken across the center of the face is one important measurement. Another important measurement is the total length of the jet. The easiest way to get this is to place the jet internal face down on a flat surface, such as a table. Then place a stiff piece of paper, such as a piece of an index card, across the end of the jet. Now use a ruler to measure between the table and the card. This should give you the total length. If you are good at taking measurements you can send other dimensions such as the opening size on the diffuser (back of the jet), the length of the diffuser, etc. The size of the hole in the tub can be helpful if you can get it. The more information you can supply when you contact [email protected] the easier and quicker we will be able to get you the information that you need to order your replacement jets. We are committed to helping get your correct parts, but remember it is you who are the most important since you are the collector and confirmer of the needed information. Working together makes your repair go smooth.